Mirror ball, swinging multiple reflections, creates an atmosphere of celebration and fun. It is used both for discos and for decoration of the apartment is decorated in a suitable style for the party. To make this elegant bowl can be quickly and easily from scrap materials. Disco ball you can do with your hands the size you need. To do this, pick up a balloon made of thick rubber so that when inflated it had a round shape. Balls of fine soft rubber and can not withstand the process of pasting papier-mâché and about to burst. 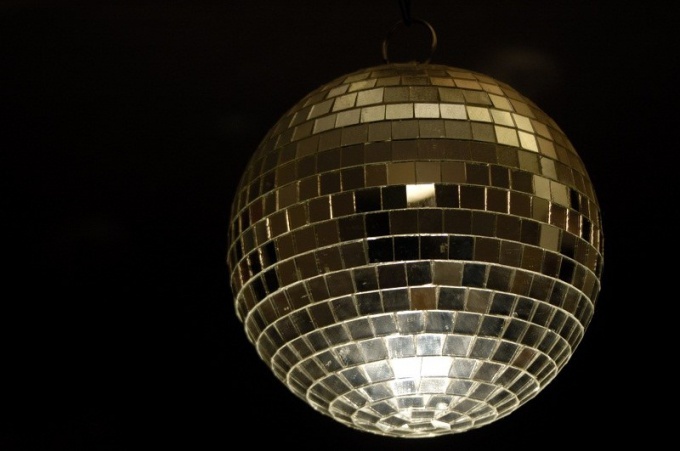 As the basis for the mirror ball can be used a large plastic Christmas ball, or billet of foam. To create a reflective surface you need thin mirror and glass or mirrored plastic. Comfortable to use leftover materials preserved after repair. If they are not available, use old CDs. It's easier to work, but to reflect light they will be worse. Blow up a balloon to desired size. Newspapers Narva hands into small pieces and combine in one bowl, the second bowl Narva plain white paper. You can use the version with b/W and colour paper. This is done so that when pasting, you can see the alternating layers, and the ball was round, not oval. Cover the table with plastic wrap. Smear the ball with vaseline or another greasy cream. Put the the surface of the paper strips with a little overlap on each other, accurately their PVA glue. The second layer paste a paper of a different color. So make 5 or 6 layers and leave the ball to dry. Instead of PVA glue, you can use Wallpaper paste or cook the starch or flour paste. If you plan to hang the ball cut in pieces of mirror, then do another 10 layers of paper. The basis will become stronger, and the heavy mirror can damage it. For mirror, plastic, or pieces of CDs will be enough for three layers. When papier-mache is completely dry, pierce the balloon and pull it out. To cut the mirror into pieces, put it on the table and the line of cut with a glass cutter first into strips and then into small squares. CDs cut with scissors. To discs not cracked, heat the blade of the scissors over the flame of a candle or over a burner. Pierce a balloon with papier-mache through a large needle, thick fishing line, bringing the needle out again and pierce the balloon with a pole. Tie on top of both ends of the line. This is to mount the mirror ball. Embedded in a papier-mache left on top of the hole that you pulled the balloon and inserted the needle. Using glue gun or other clear adhesive to make a smooth surface on the ball. Prepared material, cut into pieces, place in neat rows on the ball tightly to each other. Begins to spread on top. When the product dries, it can be hung from the ceiling, sending him a bright light to spin by hand.